‘Proverbs and other Moral Sayings’. Some of these latter phrases are still familiar to us today, such as ‘Rome was not built in a day’; ‘a cat may look upon a king’; and ‘a rolling stone gathers no moss’. Some, however, are more unfamiliar and sound strange and amusing to a modern ear, such as ‘good wine needs no bush’; ‘great boast and small roast’; ‘children and chicken are always pecking’; and ‘hungry dogs will eat dirty puddings’. This week Lizzie reports on an item discovered by the Lighting the Past team from within the ‘L’ section of the Copyright Deposit Collection. You can see the previous posts in the series here. 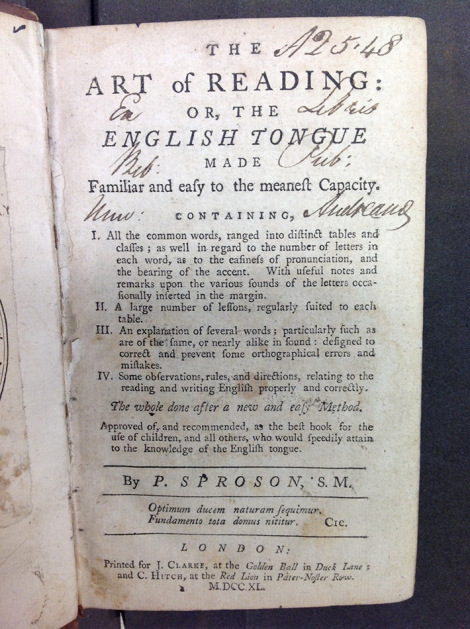 The Art of Reading: Or, the English Tongue made Familiar and easy to the meanest Capacity by P. Sproson, was a source of education for youth of the eighteenth century, but today provided a source of amusement in the Lighting the Past office. With table after table of phrases which are, as even Sproson admits, ‘a little trifling or childish’, one can find both familiar and absurd phrases within these pages.